Personal Meeting ID and Personal Link are two ways to access the virtual meeting room, also called your Personal Meeting Room, permanently reserved for you. You can start it at any time or schedule it for future use. Read how to schedule or start an instant meeting with your PMI. Your Personal Meeting ID or Personal Meeting Room is assigned to you automatically as a permanent virtual room. You can start it at anytime or schedule it for a future use. Select Edit next to Personal Meeting ID. Enter in the ID or personal link desired. 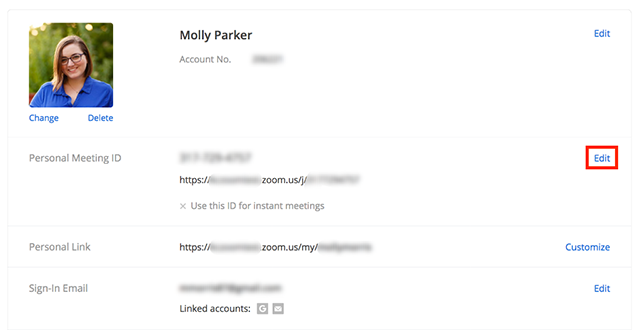 Check if you want to use your Personal Meeting ID for instant meetings. Read more about instant meetings. Note: Your personal link must be unique to you. It cannot be in use by another Zoom user, even if your account has a Vanity URL. Common names cannot be used as your personal link. Select Customize next to Personal Link.